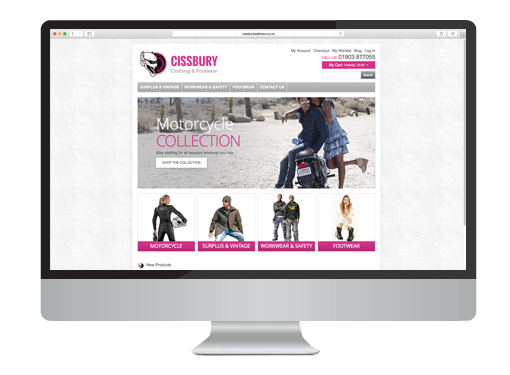 Cissbury Leathers based in Findon, Worthing approached us looking to build a completely new E-commerce website to improve sales for their vintage clothing, motorcycle and footwear products online. Cissbury already had a good online presence but were looking to upgrade from Zen Cart to a more, robust and scalable solution. The Cissbury Leathers current E-commerce website was looking dated and was hard to browse and navigate through and were looking to improve these areas for their customers. As Cissbury already had thousands of products, were looking to scale up and required a more comprehensive solution, we decided to build the new website on the Magento platform. We build a completely new website, with a clean and contemporary design and layout, which complemented the Cissbury brand, along with improved functionality, usability and searchability. The new site has enhanced customer browsing experience and has had a positive effect on sales, bounce rates and improved search engine results.